Knee injuries comprise about 55% of all sports injuries because of both the unpredictability of contact sports and the sudden directional changes that many sports require. These conditions include ligament issues (cruciate and collateral ligaments), tendon issues (patella tendon), kneecap function (patella femoral pain) and also other structures inside the knee (such as meniscus or cartilage). About 20% of sports injuries involve the shoulder. Shoulder injuries are most common in tennis, swimming, weightlifting, cricket and volleyball — basically, any sport that involves a lot of overhead movement. Most common are muscular issues (such as the rotator cuff muscles that have a strong component in overhead movements), degenerative issues (such as impingement) or an unstable shoulder (often caused by a previous injury or direct trauma). 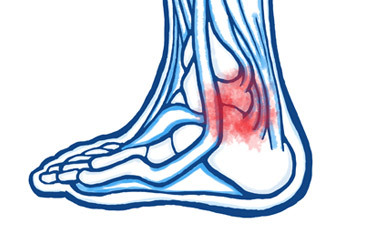 Ankle sprains are extremely common among football, rugby, hockey, basketball, and tennis players. They are almost inevitable in sports that involve jumping, running and accompany sudden directional changes. These movements can lead to turning your ankle over and challenging the physiological end range of movement of muscle tendons and ligaments. Elbow injuries account for 7% of all sports injuries. Tennis elbow consists of muscle tendon damage near the elbow due to repeated gripping or constant locking of your wrist. 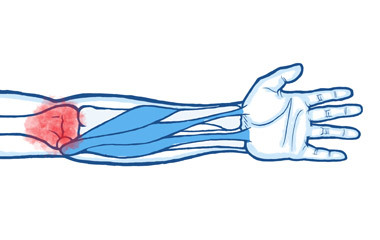 Repetitive strain injury causes pain on the outside of the elbow as a characteristic of tennis elbow. Golfer’s elbow, on the other hand, for the same reasons, usually affects the inside of the elbow. 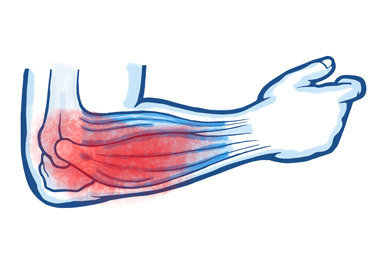 In each case pain is experienced as a result of inflammation of the muscle tendon that attaches to the epicondyle on the elbow (a bony bump on the inside and outside of the elbow). Not warming up properly, fatigue, lack of flexibility, and muscle atrophy (weakness) can cause any type of athlete to pull a muscle. The most commonly pulled muscles are hamstrings and calf muscles injuries (especially in sports involving running) and thigh muscles (often involved in kicking, for example). Shin splints is a term used to describe exercise-induced pain specifically along the front of the lower leg between the knee and the ankle (i.e. the shin or tibia). 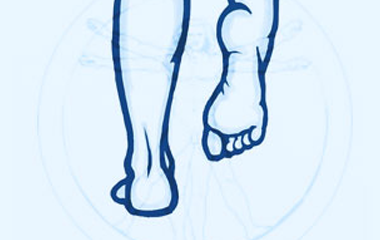 It is one of the most common presentations in the lower leg anatomy of people involved in sports. It often affects people who suddenly increase the intensity training or perform jumping or running on hard ground. 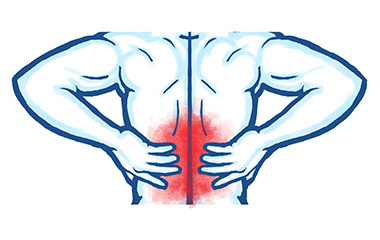 Although spinal pain is much less common among athletes than among the general populus, it can affect many runners, cyclists, golfers and tennis players. There are obviously different lower-back issues but the most common presentations are joint pain (vertebral or sacroiliac joints), muscle pain and trapped nerves. A strained groin usually affects the adductor muscles (the fan-like muscles situated in the upper thigh that serve to pull the legs together). This usually happens when you suddenly change direction while running, such. Symptoms include sharp pain, swelling and sometimes even bruising on the inside of the thigh. 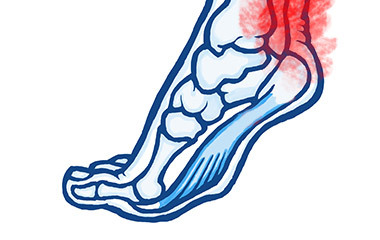 When the tendon at the back of the ankle (the Achilles tendon) is overused, inflammation and pain can occur, which is known as Achilles tendinopathy. 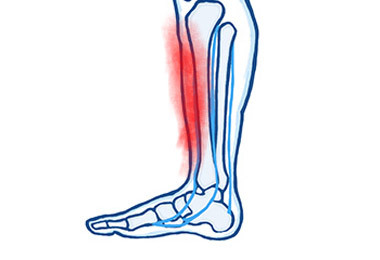 If this condition is left untreated, it can become chronic and the injury can worsen until it becomes difficult to run. Achilles tendinopathy is most common among runners and athletes who participate in sports that involve running or jumping. Injury to the neck can happen when a tennis player looks up to serve or hit an overhead smash. 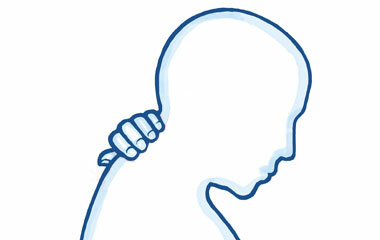 The pain is typically located on one side of the neck, and it is usually painful to turn the head in the direction of the pain. Cyclists who use racing handlebars may also feel neck stiffness and discomfort due to their posture and position required to look at the road ahead. After a long ride, the neck muscles may tighten up and feel restricted. Rugby players can also make tackles that forces the neck into difficult positions.